Built in 1930, the Phoenix Theatre is a curious mix of classical theatre architecture and the Art Deco style. The columns and arches of the Phoenix Street entrance and the gorgeous murals in the auditorium could come straight from any Victorian theatre in London. But the mirrored corridors and elaborate geometrical patterns that feature heavily in the interior are in the super-modern style of the 1930s. 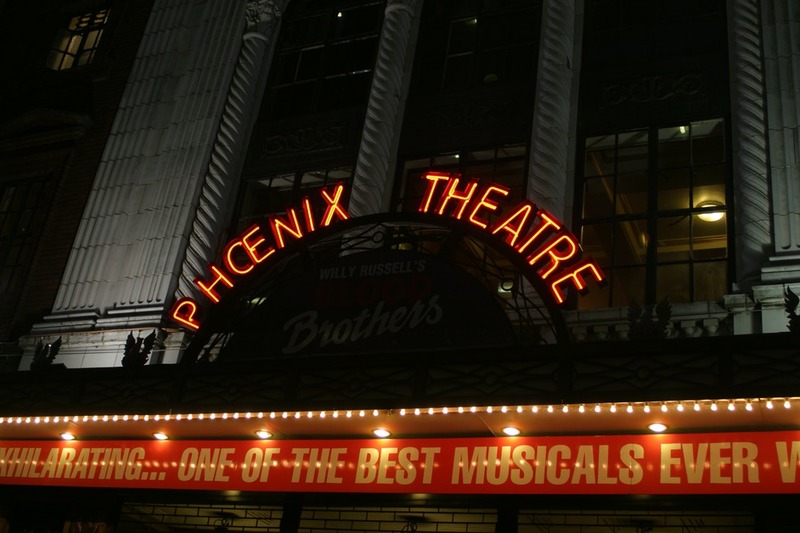 The Phoenix has had a number of long-running popular hits, including two decades of Blood Brothers. It has also been home to successful high-end drama and comedy. Its opening night was the premier of Noel Coward's Private Lives starring Coward and a young Lawrence Olivier. Subsequent decades brought several more of his plays to this stage and in 1969 the theatre bar was named after him. Kenneth Branagh directed a season here in 1988 which proved that Shakespeare could still make money in the West End. Christopher Ashley directs the UK premiere staging of the Tony Award-winning musical about the residents of a small Newfoundland community, who take in grounded passengers in the aftermath of the September 11 attacks, with a book, music and lyrics by Irene Sankoff and David Hein. What are the best dining options near Phoenix Theatre London? Phoenix Theatre gyms, sporting activities, health & beauty and fitness. The best pubs near London Phoenix Theatre. Phoenix Theatre clubs, bars, cabaret nights, casinos and interesting nightlife. Where to have your meeting, conference, exhibition, private dining or training course near Phoenix Theatre. From cheap budget places to stay to luxury 5 star hotels see our special offers for Phoenix Theatre hotels, including Radisson Blu Edwardian Mercer Street from 87% off.